For this look I have used my Blank Canvas Cosmetics 88 Matt palette. I love this palette its the best thing that I have purchased in a long time. I used a light brown just above my crease so that all the other shadows will blend much better. In the crease I used a medium brown to define my crease and blended it to make it very soft and barley there. On the lid I used an orange and packed it on to make it as vibrate as possible. In the outer 'v' I used a dark brown to define it more, also blend as you go. For the liner I used my Collection liner pencil to soften the look and blended it out. Hey guys, so I know I haven't wrote anything on my blog for so long, but I just didn't have the time. Today I come to you with my latest video that I just uploaded on my channel. I did a first impressions on the Rimmel Scandaleyes Retro Glam Mascara and I got a lot of views ( for my channel it was a lot of views) so I thought I'd do an other one. This mascara isn't new I don't think its my first time every buying anything by Collection or Collection2000 as it was known as before it changed. What attracted me to this mascara is the packaging and that its a thin tube. So the brush would be think too. I didn't write a review of the Rimmel Mascara but if you would like to see my first impressions of that video click here. When I opened this mascara the brush is slim and a very traditional brush. Not much product come on the brush which I thought would be a good thing, but in fact its not that great. I had to apply like 3 to 4 coats of this mascara before it looked anyway decent. Hey guys. I haven't been posting anything and I'll tell you why. My computer is nearly gone dead the hard drive is on its last legs. I was trying to get a new computer but I have to save for an other while. Anyway on to something more fun. I have a new uploading schedule on my YouTube Christina Curtin. Make up Mondays: Where I am going to upload anything to do with make up. That could be anything to do with tutorials, reviews hauls or what ever you guys may ask me to do. Tag Tuesdays: This is not going to be every week but when ever there is a good tag going around I will do it on a Tuesday. If you have any suggestions I will always take them aboard. Fun Friday: I was thinking of doing Vlogs, or anything that fun, like coloring my hair, Oufit of the days. Hey everyone. So I was looking around for a new mascara as the mascara that I am using at the moment is hurting my eyes, I think that's a sign that it's gone off. To be honest I do have it for a long time and its a great mascara, its the Rimmel Accelerator mascara the old one. ( Don't have the new one yet). As I was in Superdrug the other day I spotted MUA's Mega Volume Mascara. I am really impressed with the price as it's only 3.75. This is my first impressions of this mascara. As I opened it, the brush is plastic medium bristles. The brush it's self is quite big, which I am not a huge fan off. The formula is dry as there is not that much product on the brush. I don't like mascaras that are too dry or to wet, I like them to be just in the middle. I find that its hard to get a mascara that is just right. When I started to apply it, I found it hard to get all my lashes on to the brush as its so big, and I pocked my eye with it as I am not used to using such a big brush. The fist coat was absolutely terrible. It looked like I didn't even have any mascara on atal atal. I gave it about 30 seconds as applied an other coat to see would be it better. It was an improvement but not that much. I have to say I had to go and apply my accelerator. Its not as black as I like my mascaras. Its says Mega Volume, it delivers non of that. I didn't get any volume from this mascara. All I got was nicely separated lashes that were hardly seen. Its only that bad with an other mascara over it, but if your thinking of buying this and just using on its own, I would leave it and try something else. I like to use one mascara and not two or three, its just to much effort to be honest. I will not be repurchasing this product again. All in one you are really paying for the price, its a low price and a low quality product. Hey everyone. I got this eye shadow a good few months ago, but I wasn't sure how to use it properly. I had to play around with it and see whats the best way to use it. This is a newish product it only came out about 6 months ago. I did my eye make up this morning because I was making a video and I always like to have something different on my eye, just to change it up around. This is a loose power and its a lovely rich blue color. This shadow come is dark gray, and I think green. They are really fun shadows to play around with. They are now your every day kinda color, but its really nice to have in your collection. For this eye shadow to stick on your eye lid and not for it to move all day. You need a good base and a cream shadow or a pencil so that it has something to stick to. I used my Rimmel 'Jungle Green' eyeliner. This also helped the blue even more vibrant and stand out even more. You can also use the eye shadow wet. Simply wet your brush not to much though, then dab into the pot. If you try this pigment dry it has a lot of fall out. Its very easy to wipe away or just dust away with an other big brush. I love love this product and I will defiantly will be using it more often. I have green eyes so it make my eyes to stand out too. This shadow will last me for a long time as you only need a very small amount of this, and it comes out so vibrant. The color pay off is awesome! Hello to all of my new readers. I am so excited this is my first official blog post. I didn't know what to blog about for my first post and I thought about it for ages, and then I thought it should be something that I have been really enjoying using. I love love paining my nails but I have always hated taken my polish off. It was a nightmare for me. 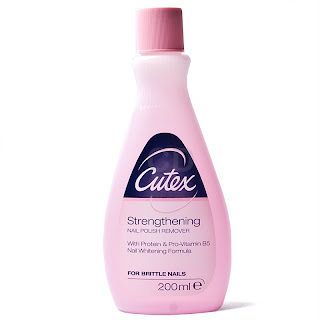 I got the Cutex Strengthening nail polish remover just the other day. I didn't purchase this product for a very long time as I remember it wasn't that good. But I have to say my opinion has been changed, and I am in love with Cutex nail polish remover. I have tried so many nail polish removers and non of them have been as good as Cutex. I bought it in Boots for just 2.60 and I thought it was good value for the 200ml. I nearly didn't pick it up but just to give it an other try. I am really happy that I did. It was no effort at all to remove the polish that I had on. With in a 5 seconds my nail polish was off my nail. I have to say it was very surprising how quick it removed the nail polish. The top coat that I use is Avons's mineral fix and its a very very think formula. Something on to the gel top coats you can purchase, and let me tell you that its really hard to get that stuff of your nails. It was no problem for Cutex though. I can't say enough good things about this product. I will be repurchasing this nail polish remover for sure. I will never be getting anything else. I have not tried it when I had nail art done. But I'm sure it will take off the layered nail polish. It has to be tried out. Hope you all have enjoyed this post. Enjoy your day!